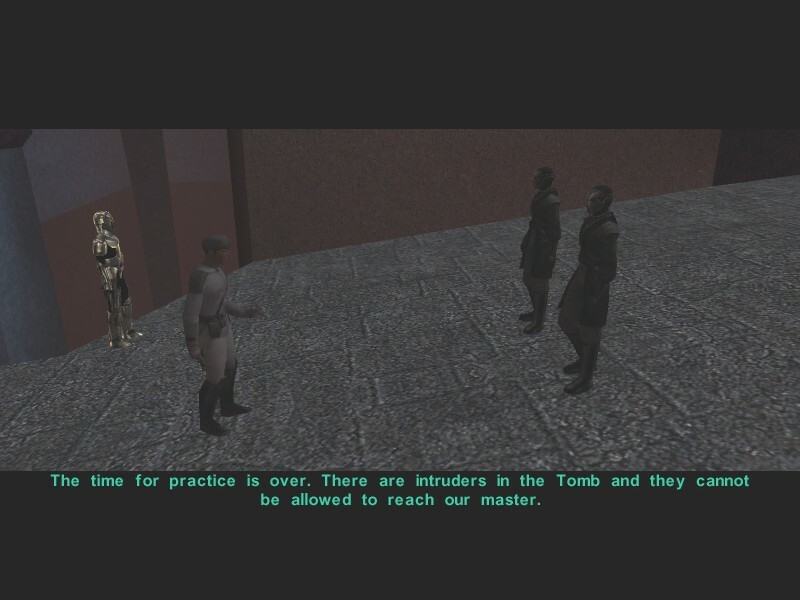 4000 years before the events of the movies, but a few years after KotOR1 the Jedi Order had been practically crushed. The Jedi knights, including even the young ones and the Padawans, have been almost totally annihilated. After the battle of Dantooine the few Jedi survivors are on the run, they have to hide for their life. The Jedi, who used to be the protectors of the innocents, and the guardians of the piece are now pursued throughout the Galaxy, and are being hunted like an animal for a bounty. The Sith pay a big money for each hunted Jedi, so independent bounty hunters, and also the rich Exchange thugs are interested in that "business". The Sith Empire used filthy intrigues and false accusations to set the civil population of the Galaxis against the Jedi. Therefore most of the people hate them recently, and if they meet a suspicious person, who looks or acts like a Jedi they often denounce them to the Sith. 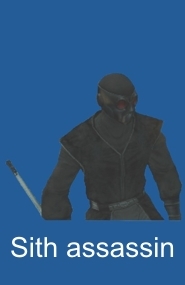 Our playable character in KotOR2 (the Exile Jedi) is a similar exception, a similar survivor. He did not obey the will of the Jedi Order, and went to war with Revan, for that he was outcasted by the Jedi, (maybe it was his luck), because he was not present when the Sith overran Dantooine, and destroyed the Jedi Enclave. But the "wanted" masters are still being pursued by independent bounty hunters, and thugs from Exchange, and Sith, and Jedihunter droids, and Sith Assassins, who were specially trained to capture or kill the Jedi. The Sith Assassins were a sect of covert Force sensitive killers secretly founded by Darth Sion and Nihilus on Malachor V during the Mandalorian Wars. Prospective Sith who were found to be force sensitive were taken to the Trayus Academy to be trained as Sith Assassins. 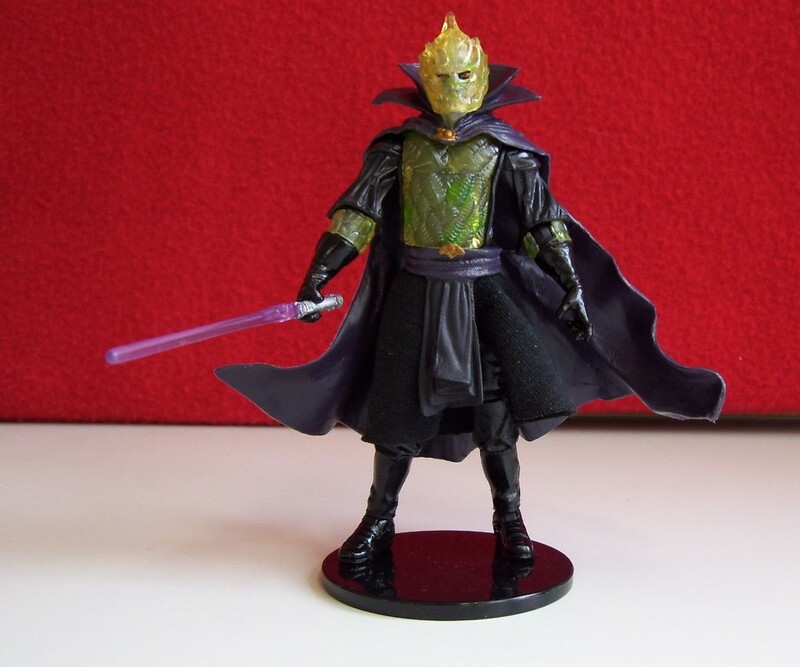 The Sith Assassins were unique because they preferred to ambush their intended prey from the shadows rather than engaging them in open combat. Almost always working solo or in small groups, they utilized stealth field generators and the rare art of Force camouflage to aid their surprise attacks. While some elite assassins fought with lightsabers, the majority utilized less remarkable melee weapons, such as force pikes, similar that we see in the hands of General Grievous's Magnaguards. These stealth warriors were also unusual in that they drew their power from the Force presence of their prey. The stronger their targets were in the Force, the stronger the hunters became. 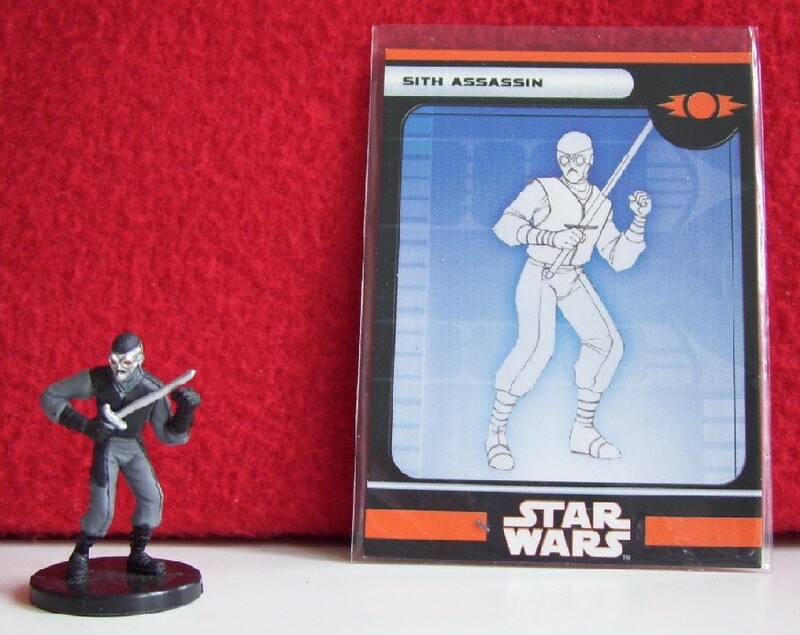 During and after the Jedi Civil War, the Assassins' primary purpose was to kill or capture Jedi. Upon successfully incapacitating a Jedi, the captive would be tortured until they fell to the dark side or died by the hands of elite Sith operatives trained in the art of torture and temptation, such as Atton Rand. By this subtle method of capture and conversion, the ranks of the Sith Assassins swelled as the number of Jedi decreased. The Sith Assassins reached their zenith under the leadership of Darth Traya, Darth Sion, and Darth Nihilus following the almost complete annihilation of the Sith Empire's Dark Jedi during the First Sith Civil War. 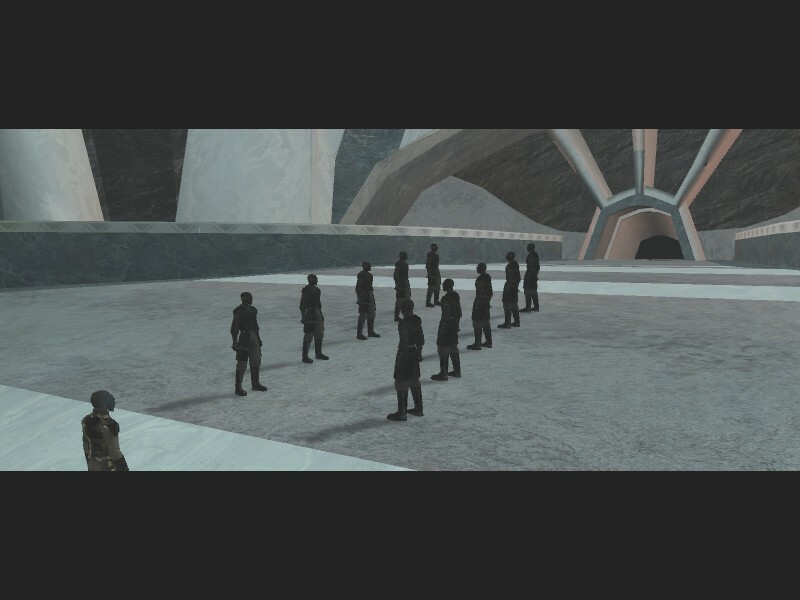 Based within the hidden Trayus Academy on Malachor V, the Sith Lords commanded legions of Assassins to hunt down the remaining Jedi throughout the Galaxy. Their efforts proved quite successful as they very nearly caused the complete extermination of the Jedi Order. During the New Sith Wars, the project became so popular that three Academy trained "newly graduated" Sith assassins to the "labor market" from three schools: from the Ryloth Academy, Umbara Academy, and Nar Shaddaa Academy. At least eight of the Umbaran Sith Assassins even survived the New Sith Wars, but they were all killed by Darth Bane who did not wanted to "employ" them on the SIA agency, maybe his manning requirement were fulfilled. :-) SIA stands for the New Sith Order incorporated agency called Sith Intelligence and Assassination. 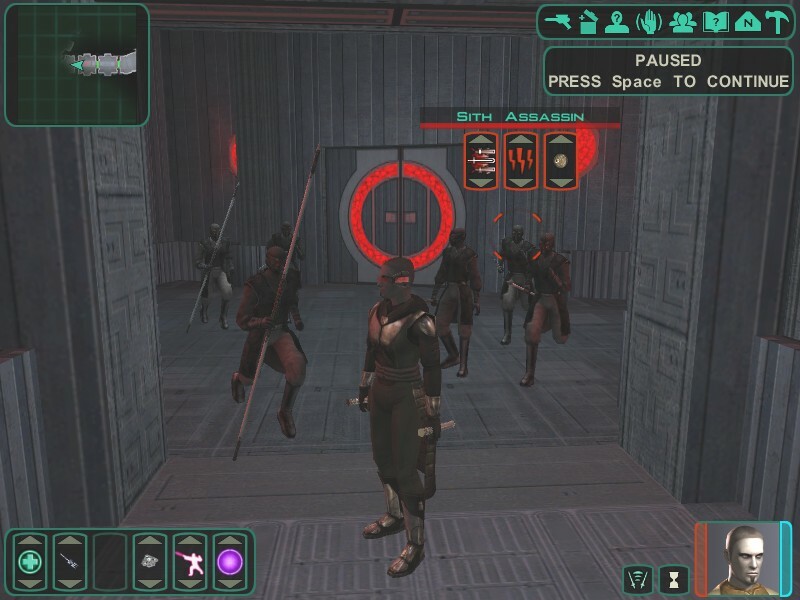 During Exile's journey he will encounter MANY of these Sith Assassins at several location. 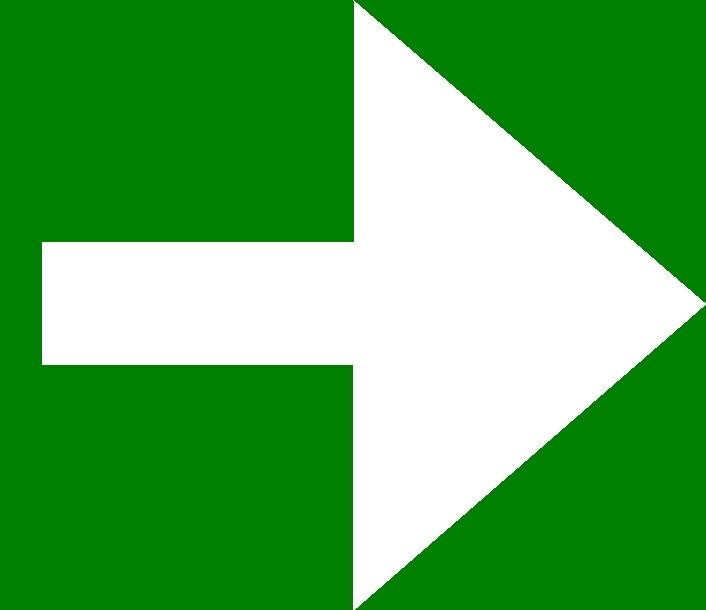 They are following him and his team, because that dozen of people are a jackpot for them. Exile is the last of the Jedi, Atton is the lost Jedi, Brianna -also known as- Handmaiden is the daughter of the famous Jedi Arren Kae, and she will becomes a Jedi, too, with the help of the Exile Jedi, and they are all very popular target person. Not to mention two ex-Sith: Kreia, who was the former master of Revan and Darth Sion, and Visas Marr, who left Darth Nihilus, and offered her help and love for the Exile. These two were very valuable scalps. Also, Mira could be trained to be a Jedi Sentinel in the game, so this small Jedi group worth millions of credits for the Sith. These Sith Assassins are protecting the tomb of Freedon Nadd at Dxun, that sacred place is crowding with them. 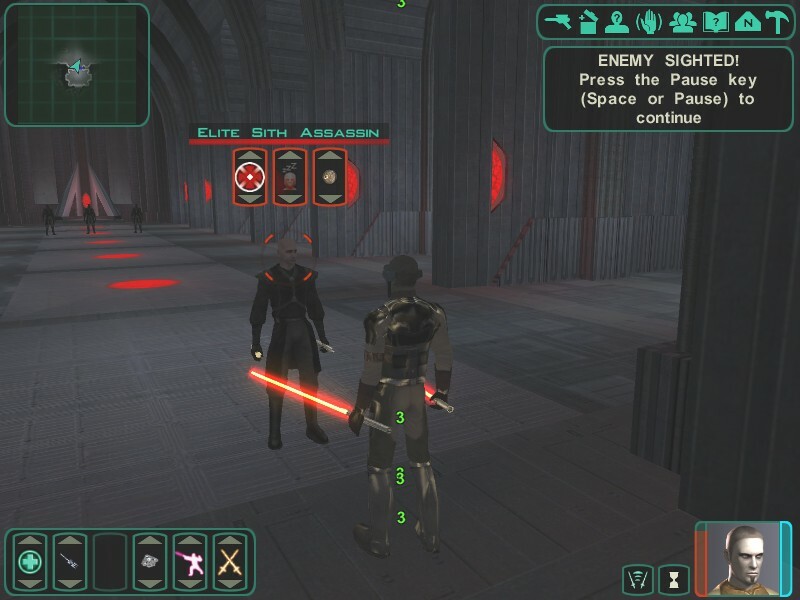 Sometimes we will meet some elite Sith Assassins in the game, they will wield a lightsaber, have a different outfit, and those elites have higher ranks, like captain, general, etc. Those elite Sith Assassins don't tolerate mistakes, they are cruel and very strict with the "normal" Sith Assassins. 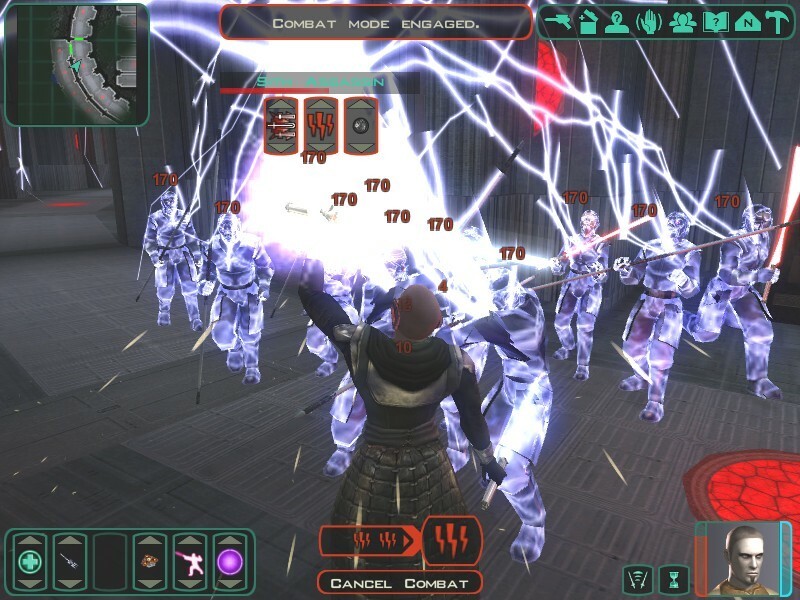 Later, a squad of invisible Sith Assassins ambushes the camp of Mandalore at Dxun, after their squads returned from Iziz, and from the Tomb of Freedon Nadd. 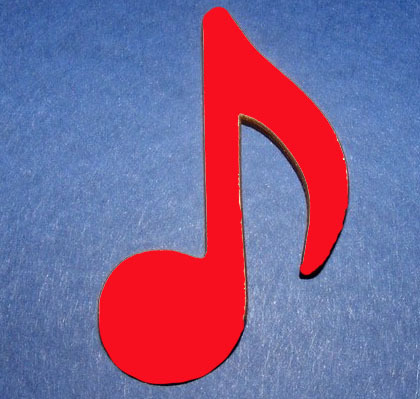 (Look at the two red circles, that I point to with the mouse cursor! That indicates two still invisible Sith Assassins, they are approaching cloaked, but the vibration of the air sometimes reveals their presence!) They wanna finish off this impudent company, but the whole Sith Assassin squad had been slaughtered by the well equipped and much stronger team of the Exile. They have to abandon the base however, because the Sith may attack again any time. Therefore Mandalore joins the group, and leaves his base back. But now they are not that running team, as they used to be. They don't have that shy Handmaiden anymore, but they have Brianna, the Jedi. Atton is no longer that injured scoundrel, but a powerful Jedi. Mira is no more a simple bounty hunter from Nar Shaddaa, she is a Jedi, too. The team goes counter-attack, they plan to visit for a friendly fight at Malachor, they wanna strike in the heart of the Sith, in the Trayus Academy. In Star Wars: Knights of the Old Republic II: The Sith Lords you can play as a Sith Assassin, if you are on the Dark Side. 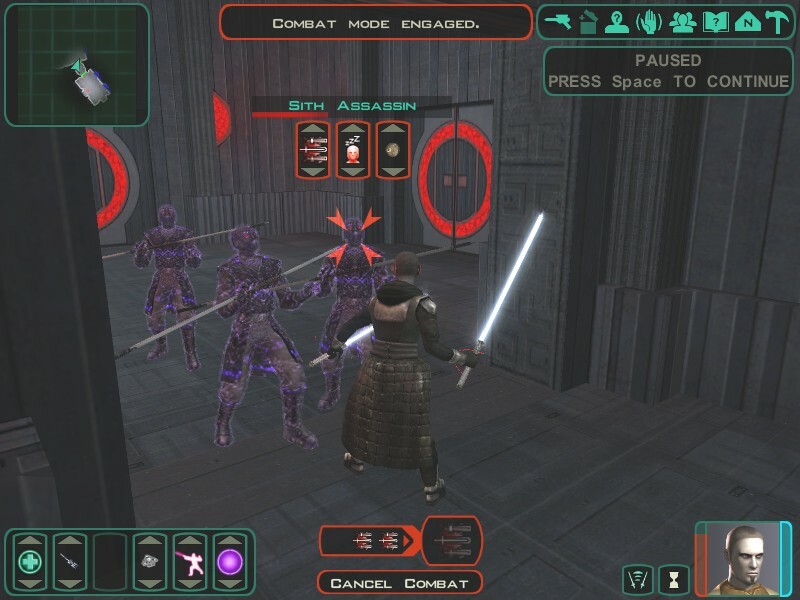 Sith Assassin is one of the six prestige character classes which the main character can select after reaching level 15. Like its light side counterpart, Jedi Watchman, this class corresponds to the Jedi Sentinel non-prestige class. All the in-game Sith Assassins have this character class. 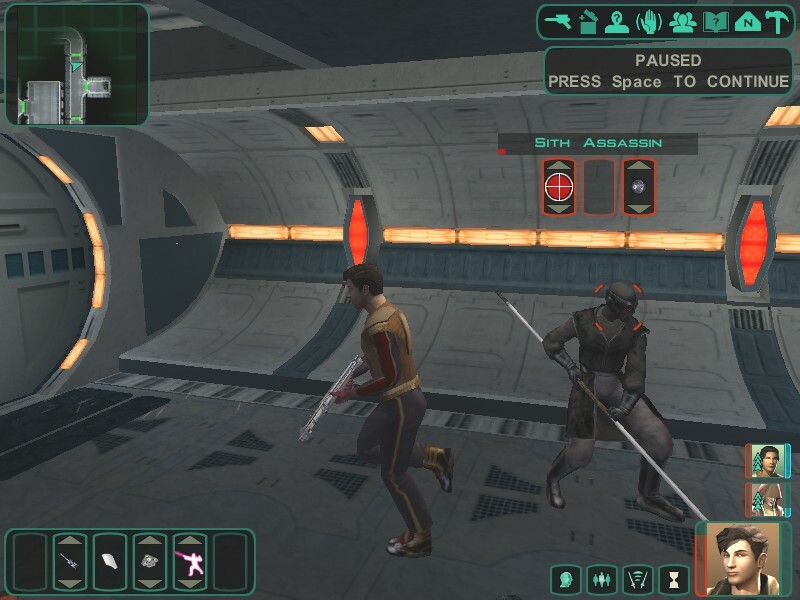 But anyway, if you got the mood to sneak to the enemy, to attack unseen, in a cloaking field like a Predator, select these silent hunters in Kotor2 as your prestige class. I hope you liked my article, and understood the Sith Assassin warfare. 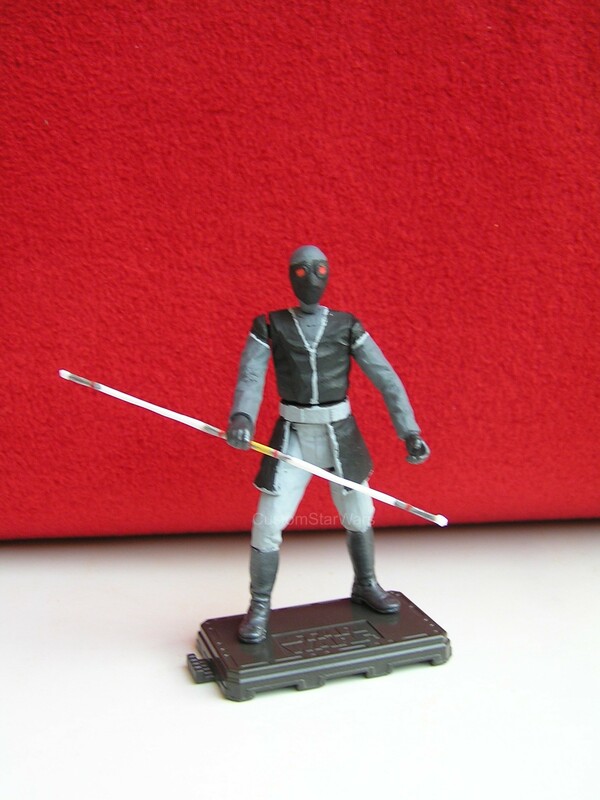 Also, I hope you'll like the following custom Sith Assassin figure, too. 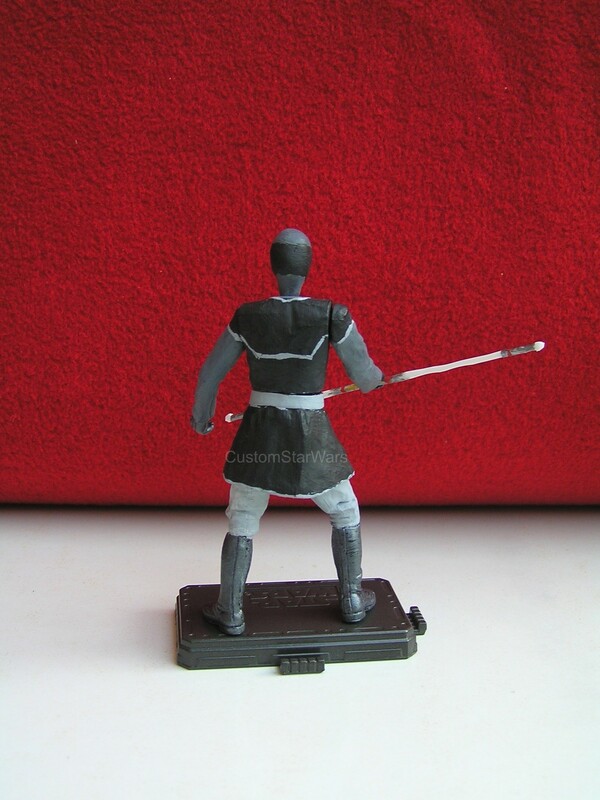 Take a look at my Custom Sith Assassin figure! Thanks for your interest! 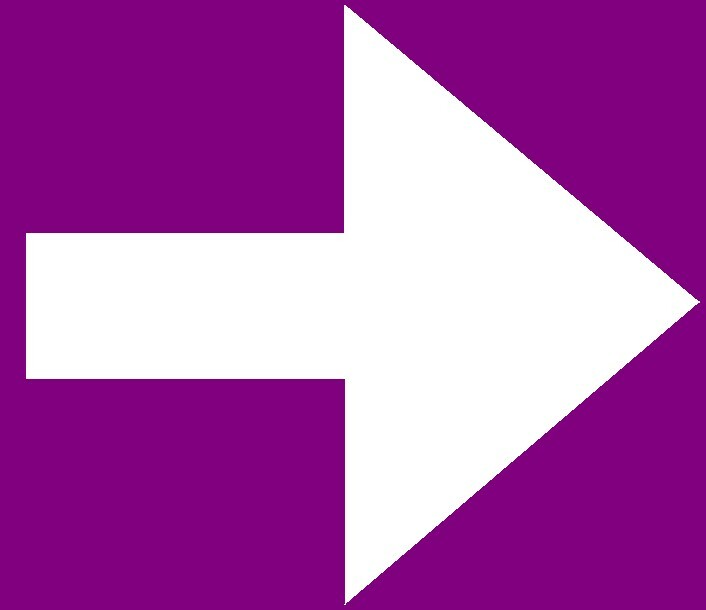 CustomStarWars is expecting you back!